US Brake commitment to excellence is seen in every high-quality brake system product they sell. Pit Stop USA is The Online Motorsports Superstore! 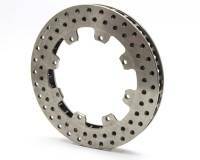 We feature Straight Vane Rotors at low everyday prices. US Brake Straight Drilled 32 Vane Lightweight Rotor - 1.25" x 11.75" - 8 Bolt, 7" Bolt Circle - 7.9 lbs. Pit Stop USA is The Online Motorsports Superstore! US Brake has a simple goal to provide the racer with the highest-quality brake system products available. US Brake commitment to excellence is displayed in every product they sell. We offer US Brake Calipers, US Brake Master Cylinders and US Brake Rotors at low everyday prices! We stock the US Brake Calipers, US Brake F88i Series Calipers and US Brake F33i Series Calipers. Design, innovation and strength are combined for unique performance advantages. US Brake Oversized GM Metric Calipers can be used in the rear to increase rear brake bias. US Brake Undersized GM Metric Calipers can be used on the right front on dirt surfaces to reduce right front braking bias or on the rear on pavement to reduce rear brake bias. US Brakeas disc brake rotors set the pace for design, quality, track testing and performance yielding a superior brake rotor. US Brake C1, C2, & SD3 racing and high-performance brake pads have gone through extensive development and testing in the toughest racing environments. US Brake Aluminum Master Cylinders one-piece design incorporates a high-capacity reservoir makes efficient use of space and materials. US Brake's aStainless Steel Borea lightweight master cylinder kit is the first of its kind to combine the features of a lightweight, modular kit with the features found in high-end master cylinders. US Brake Ultra HTX brake fluid was specifically formulated for racing under the most demanding conditions and sets a new standard for brake fluid performance. U.S. Brake Hybrid Rotors combines the strength of a 75-81 Ford Granada style hub with the lighter design of the GM Metric brake rotor for an unbeatable lightweight and durable package. US Brake GM Metric Rotors and U.S. Brake Ford Style Rotors reduce rotating weight Meets OEM sanctioning requirements for modifieds, street stocks, and hobby stocks.